There’s been a lot of fuss recently about the Coca-Cola cans that have people’s names on them. According to the Coke website, “the cans feature 250 of the most popular names among teens and Millennials on 20-oz. bottles”. I’ve been seeing pictures all over Facebook of people getting Coke cans with their names on them, as well as seeking them out. The can craze has finally reached Hong Kong, but with a twist. 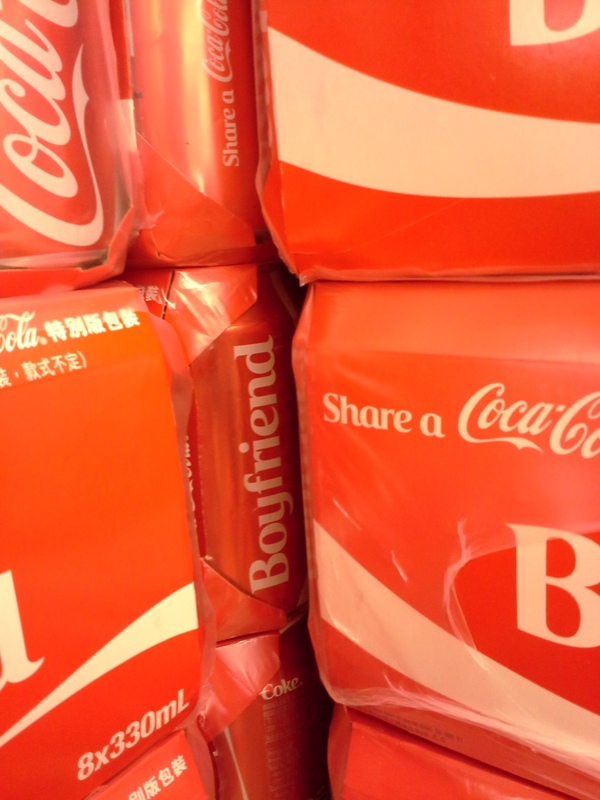 Since it would be way too difficult to put Chinese names on the cans — for a variety of reasons which I’ll try to explain later with my limited and probably inaccurate knowledge of Chinese culture — they’ve chosen to go with a ‘Beloved’ theme. Instead of using people’s names, they’re using the titles of people’s loved ones, whether it be family members, spouses, or lovers. They were all shrink wrapped and I couldn’t see what the other Beloveds were, but I’m sure there are aunties and moms and girlfriends too. I have to assume this campaign was done partly because when it comes to Chinese names there are an infinite number of possibilities and combinations of characters. In addition, Chinese characters often have different pronunciations depending on what other characters they are combined with. When it comes to naming a child, they don’t just choose a traditional or common name like ‘John’ or ‘Mary’, or a made up trendy name like MacKensie or Bladen (ugh). Rather, parents and grandparents tend to choose auspicious characters to make a name, based on the kind of characteristics they would like the child to have, such as purity, strength, obedience, honesty, and so forth. Many even consult Chinese astrologists who look at the day the child was born, and then help choose a name that has the right number of strokes to make up the character. When our child was born in Hong Kong, we had a hell of a time finding a suitable name that could be pronounced in English (for my family), Japanese (for his family), and Chinese (for the people around us). Finally we settled with Lynn, which in Japanese is pronounced Lin and written 鈴 which means ‘bell’. It works well in Cantonese because ‘Lin’ is a common Cantonese surname – 林 – which means woods or forest. So, everyone can pronounce the name of my tiny beloved. 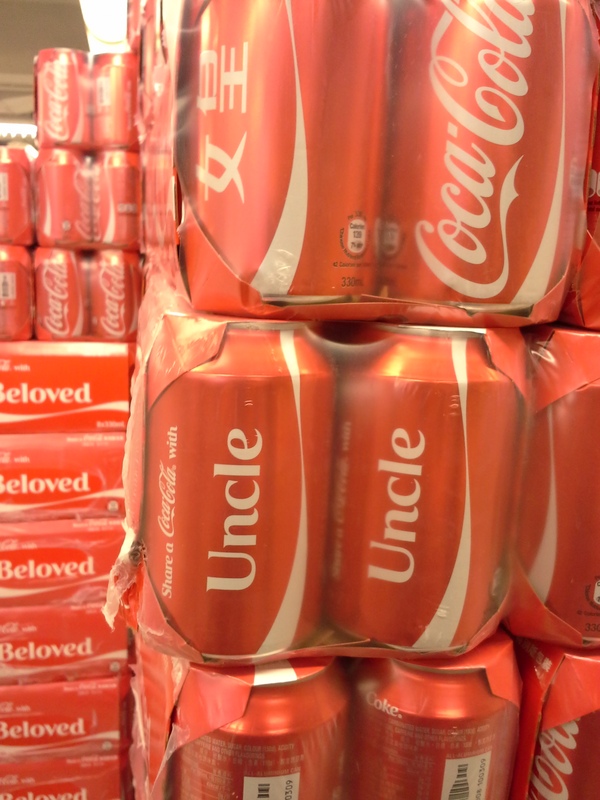 Anyway, to get back to the Chinese version of the Coke cans, I also thought this Beloved campaign was perhaps a good reflection of the Confucian values still alive and well in this part of the world, where having good social relationships and honouring your elders and family members is more important than being ‘unique’ and ‘special’. So, forget about sharing a Coke with Emily…. share a coke with your Granny! So far, we haven’t seen those around here. Your ahead of us. I miss you and relooked the pictures of Okinawa. Noticed your little ones had on crocks? Does she also like to have sand in her toes?